LEE & LOW BOOKS, award-winning publisher of children’s books, is pleased to announce the tenth annual NEW VOICES AWARD. The Award will be given for a children’s picture book manuscript by a writer of color. The Award winner receives a cash grant of $1000 and our standard publication contract, including our basic advance and royalties for a first time author. An Honor Award winner will receive a cash grant of $500. Established in 2000, the New Voices Award encourages writers of color to submit their work to a publisher that takes pride in nurturing new talent. 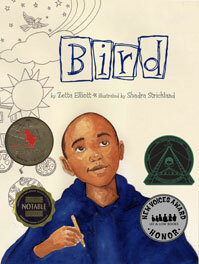 BIRD, which has gone on to win numerous awards, began as a New Voices Honoree. See Lee & Low Books for more details about entry. Please stop by by blog to pick up your Splash Award!